TOMS shoes received a lot of press last week for One Day without Shoes which encouraged folks to go barefoot to raise awareness about the impact one pair of shoes can have on the life of a child. Particularly for those in Third World countries. 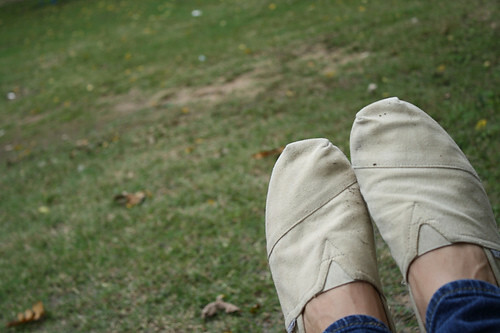 When you buy a pair of TOMS shoes, they donate a pair. This is a transcript of a recent telephone conversation between me and my friend Caryann who lives in California and works as a radio personality. No emphasis on personality. Caryann: Have you heard of TOMS shoes? Caryann: They're real big here. You know those kids probably don't even want shoes. Me: Strangely enough, I'm going to go Republican and agree with you. We need to be getting them clean water and vaccinations, rather than shoes. Caryann: My friend who did mission work in third world countries said when churches would bring them shoes that the kids would take them off as soon as they left. Me: Plus, to be honest, TOMS shoes are ugly. Caryann: Since you don't like them, I'll probably buy them. Plus, they're what everyone in the music industry wears. Me: Well, that will mean you'll also need to start wearing v-necks and skinny jeans too. And we both know that second one's not happening. Caryann: Well, you have to wear v-necks in order for them to fit over your big head. Not only are TOMS shoes ugly, they're also expensive for the kind of shoes they are. It's a nice idea to give children shoes when they don't have them, but I agree with you: they kind of need clean water and vaccinations just a little bit more. I'm going to go order a pair online now...just to annoy you. I will probably order the silver sequined ones, because you will hate those the most. Sweet mercy those things are uglier than Clarks. It surpises me that Jamie doesn't like them. I remember her magic shoes phase. You remember clunky shoes (Friends 1997) I remember asking her if they took the braces off at the store or did she have to do it herself. C: Boo to your defiance. J: Ahh...I miss Doc Marten's and the such. Clogs are back in this season.